Can You Give a Kitten Skim Milk? A kitten's digestive tract may not be able to tolerate milk. Kittens and milk may seem like a natural combination, but feeding your pet any form of dairy could lead to health problems. Skim milk, like other forms of milk, can give your little feline an upset tummy, so it's best to avoid sharing, even if she begs. Milk contains lactose, a type of sugar that can be difficult for cats to digest. While newborn kittens are able to digest the lactose in their mothers' milk, most kittens lose this ability after they are weaned. This occurs because they stop producing lactase, the enzyme that breaks down lactose. If a lactose-intolerant kitten consumes milk or other dairy products, he may develop uncomfortable gas, nausea, vomiting or diarrhea. The most common symptom of lactose intolerance in a kitten is diarrhea, which generally occurs about eight to 12 hours after drinking milk. Skim milk contains the same amount of lactose as other forms of milk, so it is not any more or less likely to cause a problem. Yogurt and cheese have less lactose, so your kitten may be able to tolerate these better than milk. Newborn kittens can tolerate lactose, but that doesn't make skim milk a healthy option for them. Skim milk from cows is not nutritionally adequate for a newborn kitten, because it contains different nutrient proportions than feline milk. Instead, the newborn should drink only her mother's milk until she weans naturally. If you are caring for an abandoned kitten who is too young to wean, you should feed her a milk replacer made especially for kittens. Ask your vet about which milk replacer to use and how to feed the kitten using a dropper. Some kittens and cats are only mildly lactose intolerant, which means that they produce some lactase, but not a lot. These cats may be able to consume a little bit of skim milk or other dairy products as an occasional treat. You can test your kitten's ability to digest cow's milk by giving her a tablespoon or two. Keep an eye on her behavior and her bowel movements for about 24 hours to see if you notice any lactose intolerance symptoms. If you do give your kitten small amounts of skim milk, count it as part of her daily treat allotment along with any tuna, yogurt, cheese, table scraps or commercial cat treats you give her. Treats should never make up more than 5 to 10 percent of your cat's diet. While your kitten may not be able to tolerate milk, that doesn't necessarily stop her from wanting it. If your kitten begs for a taste every time you pour yourself a glass of skim milk, you may want to keep some healthier cat treats or some of her favorite toys near the refrigerator to distract her with. Even if your kitten occasionally has a little skim milk, continue to provide her with fresh water at all times. Cow's milk is never a replacement for water. If your kitten develops diarrhea from the lactose, she will need extra water to replace the fluids she loses. 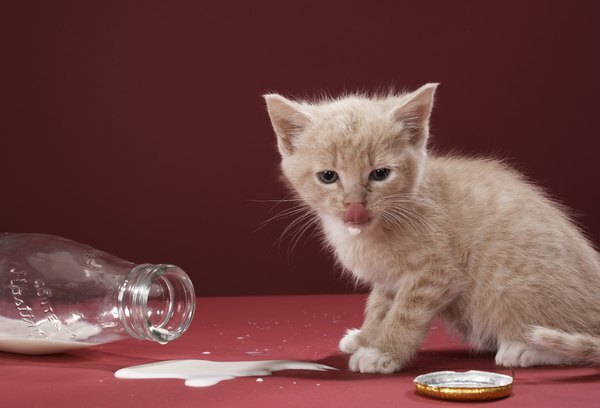 Is Milk Harmful to Kittens? Why Should Kittens Drink Water Instead of Milk? When Should a Kitten Born to a Feral Mother Cat Be Weaned? Can You Give Newborn Kittens Vitamin D Milk? Are You Supposed to Give a Cat Milk?